Meeting Venues for your Corporate Group Conference needs. Near Atlanta, GA, we are your one-stop shop for meetings and conferences. We offer a wide variety of meeting rooms that are sure to adapt to your needs! The facilities at Historic Banning Mills are great for corporate meetings or corporate retreats. With five meeting venues that vary in size and we have the flexibility to accommodate 6-150 people for your function. Free wi-fi on site that serves almost everywhere on the property. 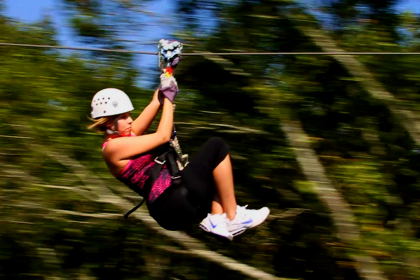 Onsite Chef, Team Building, Aerial Adventure Park, other Adventure opportunities and Day Spa! Historic Banning Mills can help you customize a package to meet your needs and requirements,.We can accommodate small-medium groups. A perfect setting for Corporate Meetings, Retreats and Team Building! Historic Banning Mills is the ideal setting for your next business or group event. Along with several meeting venues, we offer free onsite wi-fi, an onsite chef to meet your meal requirements, and staff to help with your planning needs. We offer unique team building and leadership courses to help your group get “out of their box.” Our comfortable lodging and private, beautiful location will help to reduce all the distractions that hinder productivity. Located only 45 minutes west of Hartsfield-Jackson International Airport in Atlanta, Historic Banning Mills is closer than you think! Each year we offer an exclusive Christmas and Holiday Dinner Menu for Our Corporate Guest. Additionally, you can add adventure for your team! Historic Banning Mills is the ideal setting corporate Christmas and Holiday dinner party. Along with several meeting venues, we offer free onsite wi-fi, several adventure options that you can add-on to create the perfect holiday event for you and your team. Our staff will help with your planning needs. We offer unique team building and leadership courses to help your group get “out of their box.” We even offer our comfortable lodging as an option! Located only 45 minutes west of Hartsfield-Jackson International Airport in Atlanta, Historic Banning Mills is closer than you think!